Die Martis, videlicet, 31 die Maii. Guernsey Petition, that their Ministers may be excused attending the Synod. E. Leicester, about scandalous Words against him. Harrington, Johnson, and Marshall's Petition. Thanks to Lord Paget for the Bucks Militia. Committee to draw up Instructions for Sea Adventurers. Mr. Reeves, Vicar of Ampthill. The Order to raise One Thousand Men for Ireland, for the Sea Adventurers. Lord Balmerino and Justice Heath. Message to the H. C. that the Lords agree to the Order for raising One Thousand Men for the Sea Adventurers. Freshfield versus The Town of Colchester. Committee to consider how the Charge of the Prisoners in The Tower is to be re-paid to the Lieutenant. The Gentleman Usher to give an Account of Expences he has been at, for Prisoners, &c.
Mr. Whitacre to be Lecturer of St. Mary of Bermondsey. The House appointed the Lord North to sit as Speaker this Day. 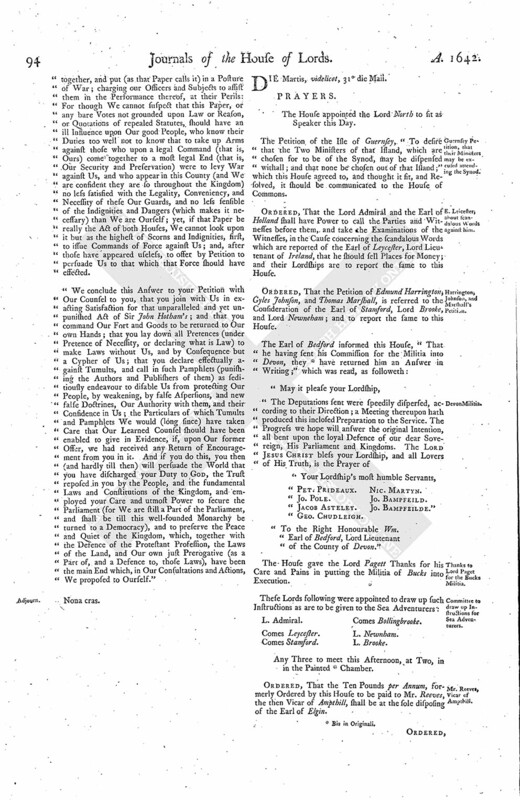 The Petition of the Isle of Guernsey, "To desire that the Two Ministers of that Island, which are chosen for to be of the Synod, may be dispensed withall; and that none be chosen out of that Island;" which this House agreed to, and thought it fit, and Resolved, it should be communicated to the House of Commons. 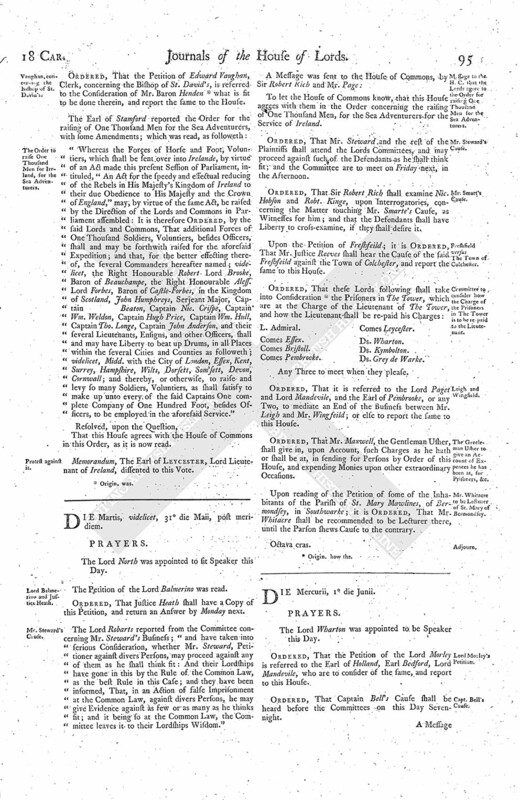 Ordered, That the Lord Admiral and the Earl of Holland shall have Power to call the Parties and Witnesses before them, and take the Examinations of the Witnesses, in the Cause concerning the scandalous Words which are reported of the Earl of Leycester, Lord Lieutenant of Ireland, that he should sell Places for Money; and their Lordships are to report the same to this House. Ordered, That the Petition of Edmund Harrington, Gyles Johnson, and Thomas Marshall, is referred to the Consideration of the Earl of Stamford, Lord Brooke, and Lord Newneham; and to report the same to this House. "To the Right Honourable Wm. Earl of Bedford, Lord Lieutenant of the County of Devon." The House gave the Lord Pagett Thanks for his Care and Pains in putting the Militia of Bucks into Execution. Any Three to meet this Afternoon, at Two, in in the Painted (fn. 1) Chamber. Ordered, That the Ten Pounds per Annum, formerly Ordered by this House to be paid to Mr. Reeves, the then Vicar of Ampthill, shall be at the sole disposing of the Earl of Elgin. Ordered, That the Petition of Edward Vaughan, Clerk, concerning the Bishop of St. David's, is referred to the Consideration of Mr. Baron Henden (fn. 2) what is fit to be done therein, and report the same to the House. "Whereas the Forces of Horse and Foot, Voluntiers, which shall be sent over into Irelande, by virtue of an Act made this present Session of Parliament, intituled, "An Act for the speedy and effectual reducing of the Rebels in His Majesty's Kingdom of Ireland to their due Obedience to His Majesty and the Crown of England," may, by virtue of the same Act, be raised by the Direction of the Lords and Commons in Parliament assembled: It is therefore Ordered, by the said Lords and Commons, That additional Forces of One Thousand Soldiers, Voluntiers, besides Officers, shall and may be forthwith raised for the aforesaid Expedition; and that, for the better effecting thereof, the several Commanders hereafter named; videlicet, the Right Honourable Robert Lord Brooke, Baron of Beauchampe, the Right Honourable Aless. Lord Forbes, Baron of Castle-Forbes, in the Kingdom of Scotland, John Humphreys, Serjeant Major, Captain Beaton, Captain Nic. Crispe, Captain Wm. Weldon, Captain Hugh Price, Captain Wm. Hull, Captain Tho. Longe, Captain John Anderson, and their several Lieutenants, Ensigns, and other Officers, shall and may have Liberty to bear up Drums, in all Places within the several Cities and Counties as followeth; videlicet, Midd. with the City of London, Esses, Kent, Surrey, Hampshire, Wilts, Dorsett, Som'sett, Devon, Cornwall; and thereby, or otherwise, to raise and levy so many Soldiers, Voluntiers, as shall satisfy to make up unto every of the said Captains One complete Company of One Hundred Foot, besides, Offices, to be employed in the aforesaid Service." That this House agres with the House of Commons in this Order, as it is now read. Memorandum, The Earl of Leycester, Lord Lieutenant of Ireland, dissented to this Vote. The Lord North was appointed to sit Speaker this Day. The Petition of the Lord Balmerino was read. Ordered, That Justice Heath shall have a Copy of this Petition, and return an Answer by Monday next. The Lord Robarts reported from the Committee concerning Mr. Steward's Business; "and have taken into serious Consideration, whether Mr. Steward, Petitioner against divers Persons, may proceed against any of them as he shall think fit: And their Lordships have gone in this by the Rule of the Common Law, as the best Rule in this Case; and they have been informed, That, in an Action of false Imprisonment at the Common Law, against divers Persons, he may give Evidence against as few or as many as he thinks fit; and it being so at the Common Law, the Committee leaves it to their Lordships Wisdom." To let the House of Commons know, that this House agrees with them in the Order concerning the raising of One Thousand Men, for the Sea Adventurers for the Service of Ireland. Ordered, That Mr. Steward and the rest of the Plaintiffs shall attend the Lords Committees, and may proceed against such of the Defendants as he shall think fit; and the Committee are to meet on Friday next, in the Afternoon. Ordered, That Sir Robert Rich shall examine Nic. Hobson and Robt. Kinge, upon Interrogatories, concerning the Matter touching Mr. Smarte's Cause, as Witnesses for him; and that the Defendants shall have Liberty to cross-examine, if they shall desire it. Upon the Petition of Freshfeild; it is Ordered, That Mr. Justice Reeves shall hear the Cause of the said Freshfeild against the Town of Colchester, and report the same to this House. Any Three to meet when they please. Ordered, That it is referred to the Lord Paget and Lord Mandevile, and the Earl of Pembrooke, or any Two, to mediate an End of the Business between Mr. Leigh and Mr. Wingfeild; or else to report the same to this House. Ordered, That Mr. Maxwell, the Gentleman Usher, shall give in, upon Account, such Charges as he hath or shall be at, in sending for Persons by Order of this House, and expending Monies upon other extraordinary Occasions. Upon reading of the Petition of some of the Inhabitants of the Parish of St. Mary Mawlines, of BErmondsey, in Southwarke; it is Ordered, That Mr. Whitacre shall be recommended to be Lecturere there, until the Parson shews Cause to the contrary.